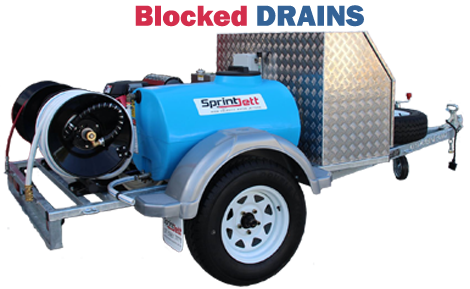 At Scully Plumbing to clear your blocked drains we use a trailer mounted high pressure water jetter. The jetter comes with a 210 litre water tank which can be topped up with a town water supply while in use. The jetter can be used at 4000PSI using 33 litres per minute which is capable of cutting through tree roots and even concrete using special jetter bits. The trailer mounted jetter can be parked outside your property, with 120 meters of high pressure hose can easily go to anywhere on your property. Hydrojet drain cleaning utilises high pressure water jets which are self propelled, cutting through tree roots and other stubborn blockage whilst simultaneously cleaning and de-scouring the internal of the pipe. This is also the same method used to unblock stormwater pipe. After we have cleared any blockage a CCTV – closed circuit television inspection should always be performed. 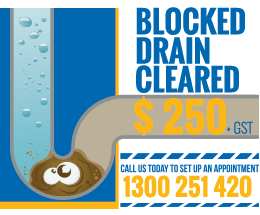 Reasons for that – even though the drain has been cleared there could be breaks in the pipe allowing tree roots to enter the pipe restricting the flow and consequently causing another blockage. CCTV can also show PVC drains which have collapsed or have been broken by a number of different ways. All of this can be shown to you by visual footage and ways of fixing the problem can be discussed. Before hydro jetting, the principle way of clearing blocked drains was by using an electric eel. This machine while effective could also damage pipes, cause injury and make a very nasty mess if the machine has to be taken inside your house. The hydro jetter remains outside your home, only the high pressure hose comes inside. The diameter of the hoses goes down to 10mm being able to clear basin wastes effectively. Electric eels move down the pipe to the blockage and punch a hole through the blockage. Hydro jetting is propelled down your pipe using reverse jets in conjunction with a forward jet. Once the blockage has been cleared the reverse jets will also clean and de-scour your pipes bringing them back to the full diameter of the pipe being 150mm or 40mm. Hydro jetting can also be used as preventative maintenance especially in a lot of commercial applications where there can be a lot of built up grease. The hydro jetter is used when it is convenient for the owner instead of waiting for a blockage to occur (caused by a build up of grease) which could lead to costly shut down of business and expensive call out fees.